Marymount School is an independent, Catholic day school that seeks to educate young women who continue to question, risk, and grow—young women who care, serve, and lead—young women prepared to challenge, shape, and change the world. 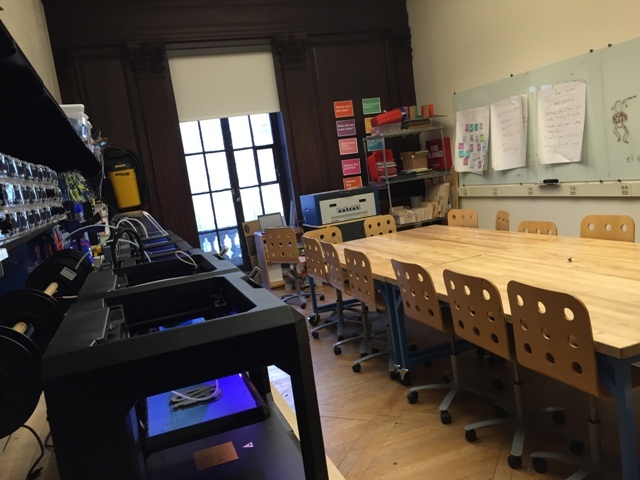 Marymount School has four specific, yet distinct, makerspaces. The Fab Lab at 97th Street is our original design and makerspace. The space is outfitted with several 3D printers, a laser cutter, a CNC milling machine and vinyl cutter, among other tools. The space also has a substantial materials library, for students to use in designing wearables and other projects. The space is also a registered Fab Lab. At our Fifth Avenue campus, we have two makerspaces. The Tinkering Space is coordinated by our Art Department, and allows lower school students the opportunity to explore, design, tinker and play. This space also has a substantial materials library, design tools such as sewing machines and typewriters and a complete Little Bits Pro Library. Also at Fifth Avenue is the IDEA Lab. Students from Classes PreK through V and IX through XII use this space. It features five 3D printers, a 3D scanner and Epilog Laser Cutter. Classes such as Engineering: Interactive Design and clubs such as Marymount Makers meet in this space. The STEAM Lab is at our 82nd Street Campus and is used by students and faculty in Classes III through V. Outfitted with two 3D printers, a mini 3D printer and a variety of materials for use in design and innovation. While each design space is associated with a specific division, students and faculty are free to do design work at any of the spaces. In general, the Fab Lab and IDEA Lab are open to students and faculty all day and it is not uncommon to see older students using these spaces during their free time. Safety is also important; the Fab Lab specifically has adult supervision at all times. Yet all students have the opportunity in each space to design, tinker, create and innovate. We first ventured into the world of Maker Education almost five years ago. Our program has grown both internally and externally by word of mouth. Our faculty and students are encouraged to explore and uses our makerspaces at times when it is appropriate to meet specific learning objectives. We also do very little training in these spaces. In the same way we expect students to collaborate as part of the learning process, we expect teachers to do the same. Students and teachers both learn from each other. As such, our program has grown organically over the past five years. Maker projects, both big and small, have been infused into the curriculum in all disciplines and in all divisions. It is not uncommon to see a Class III student and teacher at the laser cutter, producing something for the Invention Convention, standing next to a Class XI student at the 3D printer, working on a project that integrates physics, design and social justice. Our senior elective, Engineering: Interactive Design, is an introduction to human-computer interaction. Students take engineering projects from concept to design to construction and execution. This year, students are designing a 3D printed human equipped with interactive wearables and sensors. The Curators’ Gallery, as part of the Class IX Humanities program, requires students to design and construct their own gallery for the Metropolitan Museum of Art. Students use tools such as the 3D printer and software such as Google SketchUp and Tinkercad to produce their own pieces (or replicas of pieces) for their galleries. Open Studio in Class VIII and IX gives students the opportunity to design their own learning experiences in the FabLab under umbrella themes such as Site Specific and Gamification. The Class VIII physical science curriculum has been retooled and redesigned with engineering, making and programming framing the study of physic through projects such as the botBallet. The Upper Middle School Integrated Projects is a cross-grade, student-centered, interdisciplinary project that allows students to design their own learning. Projects this year included a physical version of the videogame, Minecraft. In Lower Middle School, the STEAM Lab is also a lab for exploring experimental technologies. Students use tools such as the Oculus Rift, Hummingbird Robots and Sparkis, a newly-released robot, to collect data from their world. In Lower School, the Invention Convention provides students the opportunity to design and construct their own inventions. The design process is augmented by the use of WeDos and PicoCrickets. This year, students produced their own commercials for their products in our Media Lab. We are currently planning the construction of the School of the Future, a new building with innovative, flexible, dynamic teaching and learning spaces, that should open by 2021. In the short term, though, we see making and design education as continuing to support and enhance our already, rich, vigorous curriculum. In the fall of 2014, we started the Making and Learning Institute (MLI). Supported by a generous grant from the E.E. Ford Foundation, the Making and Learning Institute offers a new paradigm in professional development. Instead of self-contained, teacher-centered workshops, you will be immersed in an experience that will allow you to observe innovative practices in an innovative school setting. Half-day immersion experiences. These experiences may include: classroom visits; making and learning conversations with our students and teachers; tours of our two digital fabrication labs and tinkerspace; and design in education experiences. Maker Day at Marymount. An annual event for students, teachers, designers, makers and doers. Design, Do, Discover. We’ve partnered with Castilleja School in Palo Alto, CA to offer a two-day workshop for educators who are passionate about hands-on learning and interested in the practical implementation of these experiences in the classroom. Maker Education Impact Summit. We will be hosting this one day conference in May to promote maker education in schools. More information on the Making and Learning Institute may be found at making.marymountnyc.org.